I have never met a sunflower I didn’t like. Have you? Honestly, don’t they make you S-M-I-L-E ? They are so easy to grow. And I’m sure if you feed birds, you have witnessed the sunflower that was randomly “planted” next to the bird feeder. They are so easy to grow. Even when I go to the farmers market I can still find some to buy. The farmer I buy mine from each week sells sunflowers at 3 for $1.00. So, for 33.333333333 cents each, I can afford to pass them out to friends and co-workers. Then I get to watch them S-M-I-L-E . Did you know that the heirloom sunflower “Mammoth” can grow ten to twelve feet tall? And have heads that could possibly stretch up to twelve inches across? This is the biggest sunflower out there. And the best part is, if you grow one, you will never have to buy seed again. WHAT?!!?! I have been growing this sunflower for many, many years, and save one of the heads each year, and have hundreds of seeds. I have so many seeds, that I am going to send some to you if you are one of the first 25 readers to like or share this post. Really. I want to share the Sunflower S-M-I-L-E and then you can grow some and share them with your friends too. Don’t worry about the size, they are perfect for an urban farmscape. I fell in love with them when I first grew them at my farm. I planted a 10 x 10 space in a small culinary garden. They are tall, and I didn’t have much room, but I decided to try them anyway. Don’t be surprised if they are the center of attention in your garden. How to save seeds from your sunflower. First, the outer petals will start to dry up. You will be able to see the seeds when the flowers begin to fall off. If the birds start eating the seeds, you know for sure it’s time to harvest. After harvesting the flower, place in a warm dry location to dry completely. Keep the heads whole if you like and use as bird feeders or for crafts. Sunflower seeds are really hard to remove. If you want to remove them from the head, take two seed heads and rub them together. Wear gloves as the stem may have small sliver type pieces that could irritate your skin. Once a few seeds begin to dislodge, it will get easier. You will end up with some seeds mixed with some dried plant material. Clean the remaining seeds from the plant debris and then store in a cool dry location in a paper bag or paper envelope. You can feed the birds, feed yourself, or even make crafts with sunflowers. Here’s what I made this weekend while camping from a sunflower head using florists wire and picks, and some dried flowers and items found in nature. 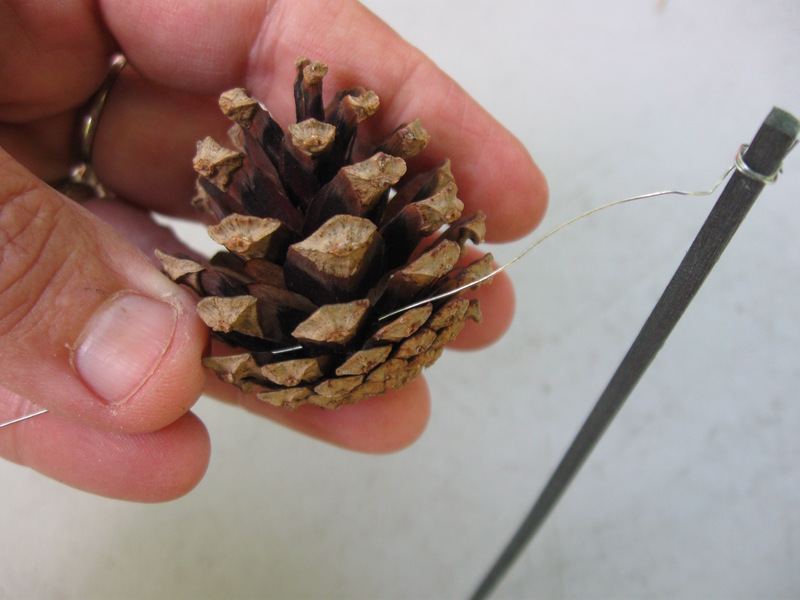 Step 1: First I used some floral picks to wrap wire around pine cones. Set aside to use later. 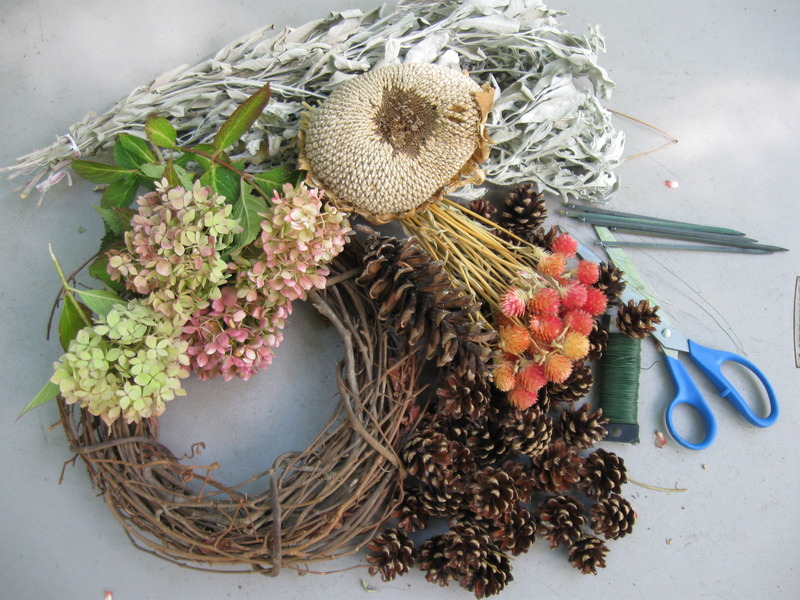 Step 2: Next, I arranged some dried flowers across the lower portion of a grapevine wreath. 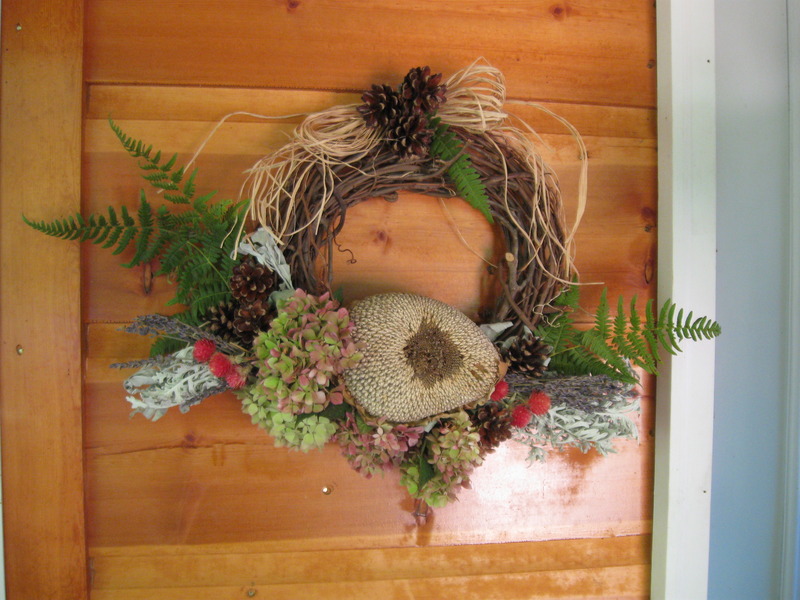 Step 3: Wire the dried flowers to the wreath using floral wire. Trim stems. 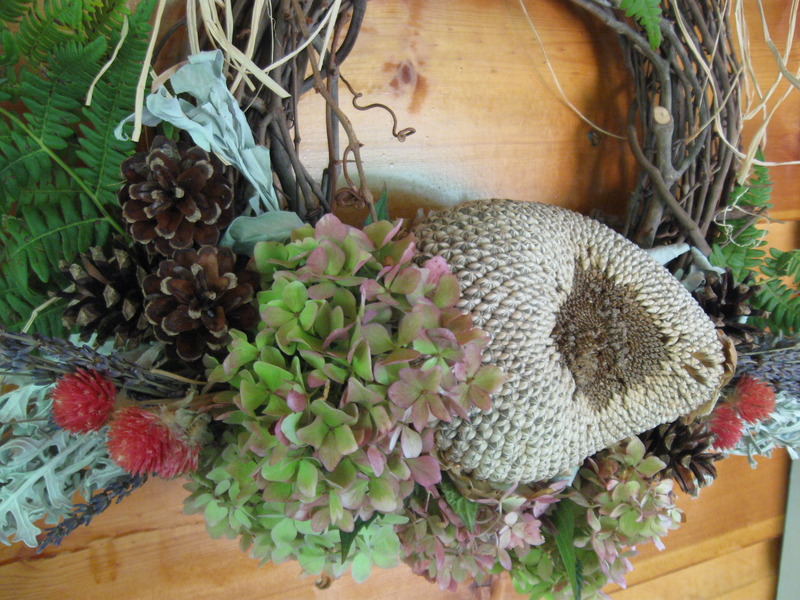 Step 4: I used floral wire to attach this sunflower head to the wreath, covering the stems of the dried flowers. Step 5: Here I inserted some fresh-cut hydrangeas as“filler”. These will dry, and still look nice. For the finishing touches, I hung it up and then placed in the pinecones where I felt they were needed. I like to look at it a bit. Then while out on a walk, I picked some ferns and used them. They will get curly and brown, and might not look as good as the others, but for now, I liked it! I’m sure that if you haven’t grown sunflowers before, you will want to grow them next year. So if you want some free Sunflower “Mammoth” seeds, this is what you need to do, it’s easy, and it will make a lot of people S-M-I-L-E ! “Like” or “Share” this post using any of the sharing buttons below to get a packet of 10 seeds. Only the first 25 people to do so will get seeds. So hurry! I will pay for the postage! Hooray!